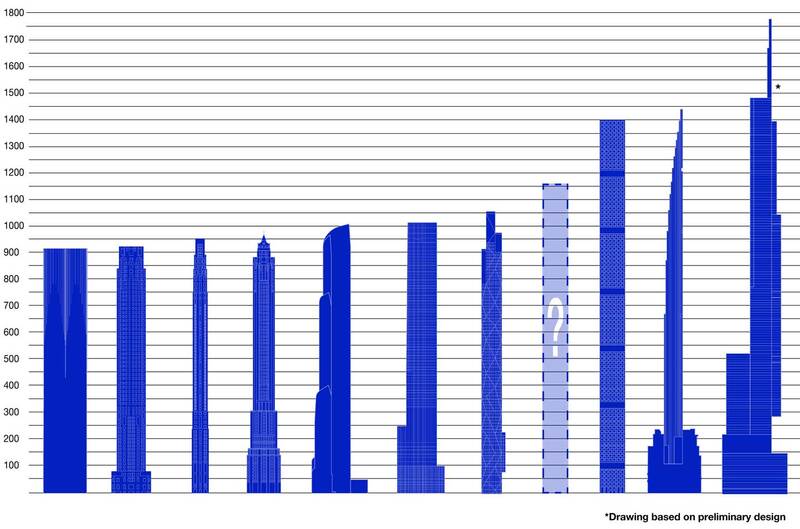 The Skyscraper Museum has just launched a new on-line series of revisionist TOP TEN lists that re-present the world's tallest towers in line-ups that rethink how buildings are measured and ranked, posing new questions that try go beyond one-dimensional thinking about vertical feet. Each illustrated list includes information on the buildings' design and construction, as well as links to archived materials on the Museum’s website. The Skyscraper Museum created a line-up of the world’s tallest towers that are "topped out" – meaning the structure has achieved its full vertical height. This TOP TEN list counts down from the 100-story KK100 to the Burj Khalifa, which at 828m and 2,717 feet is taller than two Empire State Buildings. The Skyscraper Museum’s list includes two towers that have topped out, but are not yet officially open to the public (and so are not yet qualified to be counted by the arbiters at the CTBUH). These skyscrapers are the 632-meter Shanghai Tower, which at 2,073 ft. is the world's second tallest structure, and the CTF Finance Centre in Guangzhou, China, which at 1,739 ft./ 530 m ranks as the fifth tallest (after One World Trade Center with its spire). History is the approach of our new list, which organizes chronologically all the buildings in the world that are, or were, 100 or more stories – from the first, the Empire State in 1931, through all towers topped out in April 2015. There are 17 in our frieze of silhouettes, including the twin towers of the original World Trade Center, destroyed on 9/11. Scroll right to see view the entire lineup. View the entire list with heights. The first five are 20th-century skyscrapers — all office buildings, constructed of steel, and located in New York or Chicago. Since 2000, all new 100+ story buildings have been erected in China or the Middle East, save for One WTC. What can we learn from this line-up? 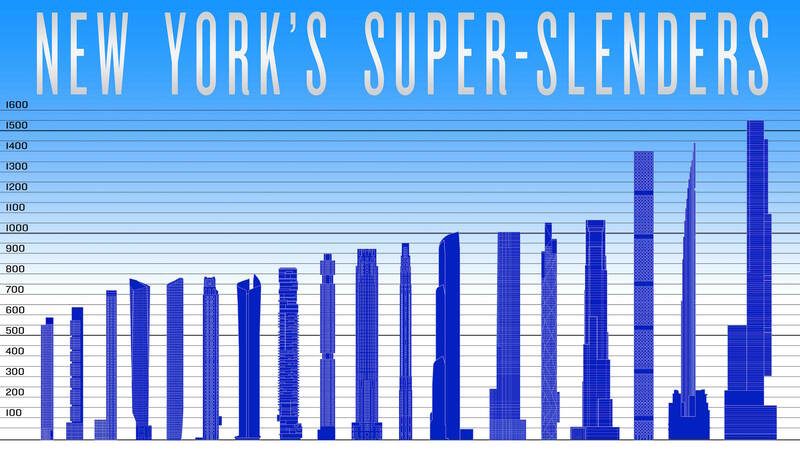 First, that the rise of the skyscraper is not a continuous climb from small to tall focused on record-breaking height. Since the Burj Khalifa opened in 2010, there have been nine new 100+ story towers. Another nine are now in some stage of construction, but the only one that will surpass the Burj Khalifa is the Kingdom Tower in Jeddah, Saudi Arabia. Views from the tops of skyscrapers have high value. Millions of tourists buy tickets to the observation decks of cities’ tallest towers, make special-occasion reservations at aerial bars and restaurants, or seek scary experiences walking on glass floors and other acrophobic inducements. Night vistas of the necklaces of lights of a sprawling metropolis hold romance, while day views afford Olympian understanding of the map and structure of a city. There are a myriad reasons to visit the summits of supertalls. The heights of observation decks are identified by black dashed lines, and publicly accesible restaurants or bars are marked with red lines. Skyscrapers with ticketed observation decks are indicated in light blue, while those with publicly accessible restaurants or bars are shown in dark blue. Telecommunications/ observatory towers are indicated in red. Scroll right to view the entire lineup. View the entire list with heights. Broadening the criteria for inclusion in TEN TOPS, our lineup above includes structures classified as observation towers by the Council on Tall Buildings and Urban Habitat, along with buildings of 100+ stories. (According to the CTBUH definition, to be called a building, a structure must allocate at least 50 percent of its height to occupied usable space.) Noted in red in our line-up, the structures erected as telecommunications/observatory towers include the Canton Tower in Guangzhou, the Tokyo Skytree, Toronto’s CN Tower, and Shanghai's Oriental Pearl Tower. While they do not have countable “floors”, these structures were a logical addition to our list because of they were as tall as our 100-story skyscrapers and because of their purpose as tourist destinations. Likewise, we included the 88-story Petronas Towers in Kuala Lumpur and Jin Mao in Shanghai because their observation decks were, in fact, higher than that of our shortest 100-story skyscraper, the John Hancock Center. In addition, our line-up includes skyscrapers without observation decks, but with publicly-accessible restaurants or bars, where for the price of a meal or a drink, visitors can enjoy the raison d’être of the venue: the view. This list of ticket prices for observation decks (click here to view prices) compares facilities on our line-up, and also suggest that food & drink establishments fall in the same range of expense. The Museum’s new exhibition TEN TOPS is not a TOP TEN list. In fact, it is anti-hierarchical! It makes a category of all the world’s buildings of 100 stories and taller that are completed, topped out, or under construction, then features around 10 or 12, zooming in on their topmost floors to examine the range of uses, from observation decks and luxury hotels, to the world’s largest clock and a private prayer room.